Hucul (also known as Carpathian, Huculska, Hutsul, Hutul, Hutan or Huzul) ponies are small horses from the Carpathian Mountains. They have a heavy build and possess great endurance and hardiness. Hucul horses bear some resemblance to the now-extinct Tarpan horse. They are named after the small ethnic group of Hutsuls; however, they have been around much longer the Hutsul people. Hucul horses are probably depicted on the monuments erected by Roman Emperors Domitian and Trajan, as Dacian draft horses. They were mentioned for the first time in written resources around 400 years ago (as the "Mountain Tarpan"). 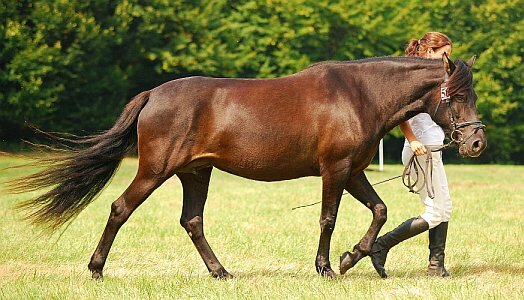 Unlike the Polish Konik, the Hucul has been only rarely cross-bred with domestic horses. In the 19th century, Huculs were used by the Austro-Hungarian Army. In 1856, the first Hucul first stud farm was established at Radauti, Romania. Several bloodlines were established by the foundation stallions Goral, Hroby, Ousor, Pietrousu, and Prislop, and the horses were carefully bred to preserve the purity of these bloodlines. In 1922, thirty-three horses were sent to Czechoslovakia to establish a herd there which would become the Gurgul line. World War II caused a severe decline in the number of Hucul horses in Czechoslovakia. After the end of the war, only 300 Hucul horses remained there. It was not until the early 1970s that breeders established an organization, Hucul Club, to prevent the extinction there caused by the declining number. In 1982 they established a stud book with fifty purebred animals with the goal of increasing the numbers in that region. Thanks to the efforts of breeders, the world population of these horses now exceeds 1,000. Most of them live in Poland, Slovakia, Romania, the Czech Republic, and Ukraine. Many ponies in Europe also have Hucul blood. In recent years the popularity of this bred has spread as far as England. Hucul ponies are usually calm with a good disposition, and are used for both hacking and pulling timber in otherwise inaccessible forested areas. They are usually bay, black, chestnut, or the grullo variation of dun, with a dorsal stripe and zebra stripes on the legs characteristic of the breed. Their conformation traits include a short head with a relatively short neck, compact body, short legs, and sound feet.